The music starts and all of a sudden you’re driven to dance. Across the tarp and through blocks, you twirl. Then your group tosses, swirling in sync as they fly in the air…a one single *clink* echoes through the gym as they catch and beam radiantly. The crowd erupts in applause, the sound bouncing off walls and vibrating inside of you, making your smile bigger and brighter. This is the life of a performer; this is the life of the winter guard. The Bellbrook Winter Guard, related to marching band color guard in the fall, is an extracurricular for dancers willing to be adventurous with a flag, rifle, and saber to put into a breathtaking show. Color guard and winter guard both have been Bellbrook programs for a long time, beginning around 1985. They began in the Scholastic A class (lower level) then in 2012, they won first and were bumped up into Open class. Two years later, they moved up to Scholastic Open. Now with their eyes on winning finals this year, they are a Scholastic World guard. With 18 members and under the direction of Sheldon Apo, this year’s show is called “Bell…Brook,” incorporating the illusion of bells in the costumes and props. 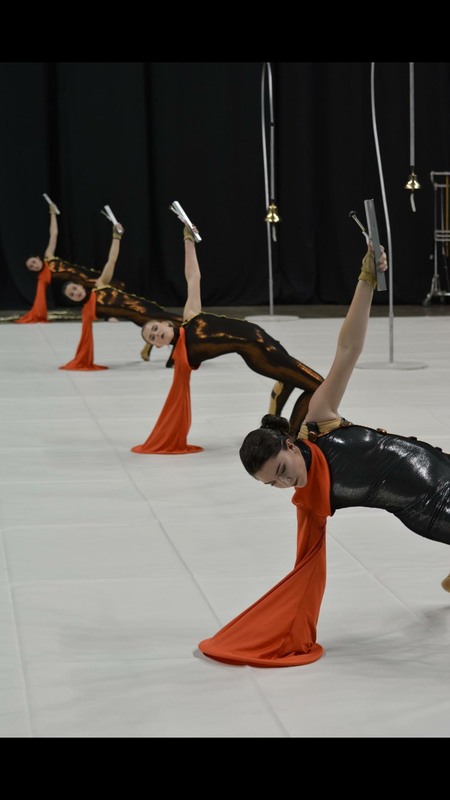 “This year our color guard staff decided to take …leaps and bounds,… a different approach to the usual ‘beautiful’ Bellbrook Winter Guard shows,” according to participating senior, Camryn Potter, “…[The show] takes a more abstract look of the Bellbrook Winter Guard’s legacy…[with] no soundtrack. Every single note is played on the floor or produced by the color guard, making it difficult to stay in time. However, our ability to stay in time comes from our great teamwork and attention to detail.” Potter has been a part of the color guard for 6 years, with a total of 10 seasons, and she still continues to perform. Practicing 4 days a week for 4-5 hours, this team prepares for competitions and climbs their way to the top. These past two weekends, they have had their first two competitions both for the local circuit, MEPA. On Sunday, February 5, they went up against Miamisburg in Northmont coming out with a score of 64. Determined to improve their score, the next weekend (Sunday, February 12) they performed at the Nutter Center, scoring a 66.6. They had WGI Indy Regional on February 18 and 19 and will perform in the Bellbrook Invitational February 25.